I just received a bad news from my good friend Ivan Rzounek sifu (www.wing-chun.cz), who is currently in China, training hard the art of Opera Boats Wing Chun (Baan Jung Wing Cheun) and researching various systems and lineages of Southern martial art: Gwok Fu sifu has passed away. 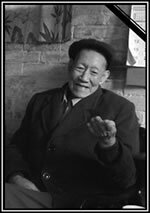 Gwok Fu sifu was one of the last living Fatsaan disciples of Grandmaster Yip Man. Me and Ivan have visited him on numerous occassions, and were very happy that he has shared with us many stories about Fatsaan era of Grandmaster Yip Man’s Wing Chun teaching, as well as many practical tips on Wing chun and martial arts in general. Gwok sifu and his son Gwok Waijaan have some solid Wing Chun, in some aspects quite different from the later Hong Kong version of Yip Man’s. Gwok sifu was always very friendly and kind to us. We will always remember – rest in peace, Gwok sifu!